Webkul has been rewarded with "Top Selling Extension 2017" award at Magento Imagine 2018. Now You can Hire Webkul Developer and get Webkul Modules Customized as per your needs. Magento 2 Web Push Notification: With the amazing extension the store owner can send real-time push notifications messages to its customers. The biggest advantage of using push notification is its ability to deliver messages immediately. These messages can contain any information such as new product launch, new offers, discounts, important news.Web push notification’s prompt and assured content delivery feature ensures that the notifications are for sure delivered and seen. As long as the browser is running, a subscribed user will get a pop-up message on top of the screen even without opening up your website. Magento 2 Web Push Notification: Magento 2 Web Push Notification extension allows you to send real-time push notifications to your customers. The subscribed users can see the push notifications on their web browser. The advantage of using push notifications is that it delivers the message immediately. Unlike emails that sometimes fail to deliver or go to the spam folder. Web push notifications are always delivered and seen by the users. As long as the browser is running, a subscribed user will get a message even without opening up your website. This improves the user engagement and retention. Please Note - This module only works with HTTPS websites. 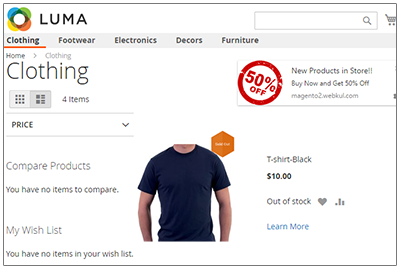 The module is very well integrated with the Magento2 platform. Push Notifications are compatible with all the web browsers (Firefox, Chrome). The admin can view the subscribed users list. It is designed to work with the SSL certificate websites. There is no monthly subscription required to notify customers. No limitation on the number of subscribed users. The admin can create, edit and delete notification templates in the back end. Any particular subscribed user can be removed from the list if it doesn’t want to receive any further notifications. A custom icon and redirect URL can be added with the push notification. Notifications can be sent either to all the registered users or selected users. Search options can be used to find any specific template or subscribed users from the lists. The admin can do the configuration of this module from the back-end panel. After setting up the Firebase credentials, it can manage message templates and send a push notification to its subscribed users. The admin can add, edit or delete templates of the notification. Search option can be used to find any specific template or subscribed user from the lists. 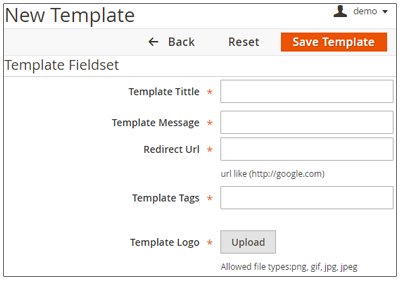 Various template information is displayed such as - id, title, tags, created date & time etc. Some information about subscribers can be seen such as id, name, subscribed date & time etc. When the admin installs this module successfully, the users will be asked whether to receive notifications from your store or not. Once the users have permitted, they will start seeing your push notifications on top of their web browser window. Notifications will stay visible for 2-3 seconds, after that they fade away. The redirect page link is embedded in the notification message. Users will see message title, logo, and contents of the message. Did you buy Web Push Notification for Magento 2? AWS Free tier hosting for one year by amazon web services, for more details please visit AWS Free Tier. GCP Free tier hosting for one year with 300 credit points by google cloud platform, for more details please visit GCP Free Tier. In our default configuration we will provide tremendous configuration for your eCommerce Website which is fast to load and response. Want to know more how exactly we are going to power up your eCommerce Website with Cloud to fasten up your store. Please visit the Cloudkul Services.